Based on exclusive interviews and access to the Supreme Court archives, this is the intimate, inspiring, and authoritative biography of America's first female Justice, Sandra Day O'Connor--by New York Times bestselling author Evan Thomas.She was born in 1930 in El Paso and grew up on a cattle ranch in Arizona. At a time when women were expected to be homemakers, she set her sights on Stanford University. When she graduated near the top of her class at law school in 1952, no firm would even interview her. But Sandra Day O'Connor's story is that of a woman who repeatedly shattered glass ceilings--doing so with a blend of grace, wisdom, humor, understatement, and cowgirl toughness.She became the first-ever female majority leader of a state senate. As a judge on the Arizona State Court of Appeals, she stood up to corrupt lawyers and humanized the law. When she arrived at the Supreme Court, appointed by Reagan in 1981, she began a quarter-century tenure on the court, hearing cases that ultimately shaped American law. Diagnosed with cancer at fifty-eight, and caring for a husband with Alzheimer's, O'Connor endured every difficulty with grit and poise.Women and men today will be inspired by how to be first in your own life, how to know when to fight and when to walk away, through O'Connor's example. This is a remarkably vivid and personal portrait of a woman who loved her family and believed in serving her country, who, when she became the most powerful woman in America, built a bridge forward for the women who followed her. I have read Joan Biskupic’s biography of Sandra Day O’Connor (1930-) and have read O’Connor’s memoirs and other books. Thomas’s book was written after she retired from the Court so contains more information about her later life. Thomas also had access to John O’Connor’s papers, diary and unpublished memoir. The book is well written and meticulously researched. Thomas interviewed almost all of O’Connor’s law clerks and staff as well as friends and colleagues. I found the information about how eac I have read Joan Biskupic’s biography of Sandra Day O’Connor (1930-) and have read O’Connor’s memoirs and other books. Thomas’s book was written after she retired from the Court so contains more information about her later life. Thomas also had access to John O’Connor’s papers, diary and unpublished memoir. The book is well written and meticulously researched. Thomas interviewed almost all of O’Connor’s law clerks and staff as well as friends and colleagues. I found the information about how each of the male Justices had to adapt (or not) to a female Justice interesting. I found the lunch meeting between O’Connor and Ginsburg most interesting. This meeting took place just after O’Connor was appointed to the Supreme Court and long before Ginsburg was appointed to the Court. Thomas provided a number of insights as well as material not covered in prior books. This book is well worth the read. I noted how far women attorneys have come since the day O’Connor graduated from Stanford Law School and found out that firms would not hire women.I read this as an e-book on my Kindle app for my iPad. There were lots of photographs. I wished I had the photograph with all the women Justices together. The book was 455 pages and published by Random House. “First” is a in-depth biography of one of the most remarkable women in American history. In many ways, Justice O’Connor has not received the recognition she deserves for being such a groundbreaking figure. Based on over a hundred interviews with friends, family members, fellow justices, and almost all of her law clerks, First offers a wide sweeping portrait of O’Connor from her beginnings on a dusty Arizona ranch hours from the nearest city to her final years when she left the Court to care for “First” is a in-depth biography of one of the most remarkable women in American history. In many ways, Justice O’Connor has not received the recognition she deserves for being such a groundbreaking figure. Based on over a hundred interviews with friends, family members, fellow justices, and almost all of her law clerks, First offers a wide sweeping portrait of O’Connor from her beginnings on a dusty Arizona ranch hours from the nearest city to her final years when she left the Court to care for her husband as he suffered from late-stage Alzheimer’s. The first part of the book traces her early years in the Day Ranch as O’Connor grew up and formed her values. The story follows her to Stanford where she met and dated future Supreme Court Chief Justice Rehnquist. But, even graduating from a top university with stellar grades only garnered her job offers as a legal secretary, not as a lawyer. Their loss! O’Connor worked her way from the bottom to become the Majority Leader of the Arizona Senate and then a judicial appointment to state court. Her struggles and success in the Arizona Legislature are detailed here but are not as compelling as the rest of her story. The story then turns to what made her famous: her appointment to the Supreme Court by President Reagan. Like the Brethren, Evans details for us the inner workings of the High Court, but with O’Connor as the center hub of the story, not Brennan. Evans both humanizes O’Connor and her fellow justices. Major court decisions are discussed as are the inner court debates on how to decide the cases. The discussion is at a level which is complex enough to appeal to a legal audience and to lay readers as well (I think). This biography is well-researched, well-detailed, and leaves one with an appreciation for what a remarkable person Justice O’Connor was and what a remarkable life she led. Many thanks to the publisher for providing a copy for review. This was one of those surprises - an available book at the library! Not one waved at me on FB or Audible or GR or Kindle sellers. . . .sometimes I worry that all I'm reading is what is being marketed at me. . . .so this was fun. A library book waiting for check-in, that I got to scoop up!This was fantastic - it was SOC's (Sandra O'Connor) story from the very beginning to now - all she has been through, and although it is a biography and not autobiographical, I think it is as close as she would c This was one of those surprises - an available book at the library! Not one waved at me on FB or Audible or GR or Kindle sellers. . . .sometimes I worry that all I'm reading is what is being marketed at me. . . .so this was fun. A library book waiting for check-in, that I got to scoop up!This was fantastic - it was SOC's (Sandra O'Connor) story from the very beginning to now - all she has been through, and although it is a biography and not autobiographical, I think it is as close as she would comfortably come in letting the public in, and that felt good to me. No big reveals or curtains to pull back leaving a trembling Oz. The writing was good, not earthshaking - I didn't find myself stopping to savor words or sentences like you do with some books - and that's ok. I wanted her story and I got it, steady and square and reporter-like. It was a fair deal all the way around.In these pages you get the view of what it took to be the first woman on the supreme court (and how many men it took to get her there, besides her own skills and smarts). Politics during the 60s - 90s are featured, the reader gets an inside view of Supreme Court justice interworkings, how to raise a family and be a judge and a caregiver - all at once - and well, If any of these are of interest to you, I recommend it highly! First: Sandra Day O'Connor, by Evan Thomas, is the first biography I have read about Sandra Day O'Connor. Clearly, a lot of research went into the book, but unfortunately the writing is disorganized and lacks focus. The introduction of her early life, her wonderful marriage to John, and her early career is well done. Her upbringing and marital support gave her the fortitude to face the sexist challenges of her time. But beginning with the Supreme Court appointment, the book breaks down. The narr First: Sandra Day O'Connor, by Evan Thomas, is the first biography I have read about Sandra Day O'Connor. Clearly, a lot of research went into the book, but unfortunately the writing is disorganized and lacks focus. The introduction of her early life, her wonderful marriage to John, and her early career is well done. Her upbringing and marital support gave her the fortitude to face the sexist challenges of her time. But beginning with the Supreme Court appointment, the book breaks down. The narrative bounces around chronologically, and it is full of details of court cases that did not serve to tell Sandra Day O'Connor's story. I felt the author needed to choose between a book about case law, or a book about SDC.There are interesting nuggets in each chapter, but I was often skimming after chapter 7.The description of her post-retirement years is quite unflattering. While it's important to be truthful, I think some interview comments could have been left out for the sake of graciousness. iCivics is a wonderful program, and perhaps more could have been said about that and less about her bossiness and rudeness.An advance copy of this book was provided to me by Netgalley. **Netgalley provided me with a DRC of this workIn exchange for an honest review**Superb. Top five of the biographies I’ve read in the past five years. The cyclical storytelling of this phenomenal account of SOC’s life, does not feel like the momentous (nearly) 500 page monster that it is, because it flows so wonderfully.Each segment is hinted at in the chapter’s title page, and the photographs included drew me into each section, anticipating the details. This book had so many pieces of incredibl **Netgalley provided me with a DRC of this workIn exchange for an honest review**Superb. Top five of the biographies I’ve read in the past five years. The cyclical storytelling of this phenomenal account of SOC’s life, does not feel like the momentous (nearly) 500 page monster that it is, because it flows so wonderfully.Each segment is hinted at in the chapter’s title page, and the photographs included drew me into each section, anticipating the details. This book had so many pieces of incredible history, lovely, thought-provoking insights and a rich blend of sentiment and shocking, political revelations to keep historians, political junkies and curious readers all transfixed. I loved reading about Day O’Connor’s tough side: forgetting to buckle in her son and her grabbing him from the side of the road, dusting him off, and continuing to drive; loving outdoor adventure; telling certain justices what to do; doing aerobics days after cancer surgery....But her heart also was evident in anecdotes about helping her staffers who were working moms, weeping over the death of her father and retirements of friends, her fear of being forced to slow down after breast cancer...and sentencing people to prison sentences in her younger days.This is very well-written and profound. A biographical gem. One of the better biographies I have read in a while. I knew very little about Sandra Day O'Connor other than the fact that she was the first female Supreme Court Justice. I really enjoyed learning about her life in the Southwest and appreciated her approach to work and success. She never made excuses, was direct in her approach, was disciplined in her habits, and she expected others to be the same in these areas. She was tough on her clerks, but also tried to mentor and look out for them. In he One of the better biographies I have read in a while. I knew very little about Sandra Day O'Connor other than the fact that she was the first female Supreme Court Justice. I really enjoyed learning about her life in the Southwest and appreciated her approach to work and success. She never made excuses, was direct in her approach, was disciplined in her habits, and she expected others to be the same in these areas. She was tough on her clerks, but also tried to mentor and look out for them. In her decisions as a Justice, she would often look at the real life impact of the cases, and also stayed away from making definitive rulings in an effort to allow the states, legislatures, and society work out difficult moral issues. Her love with her husband was special to read about, and his eventual death to Alzheimers was sad and tragic. A fascinating life and I highly recommend this book to all readers. An inspiring, and well-researched, biography of the nation's first woman on the U.S. Supreme Court. The author may be among the last to interview the former Justice (now in assisted living), and had numerous interviews with her former law clerks, colleagues (including other Justices), and family friends. He had rare access to her private papers and seems to have done formidible reasearch at the Library of Congress and at the Court.He follows her life from her early days on a ranch on the Arizona An inspiring, and well-researched, biography of the nation's first woman on the U.S. Supreme Court. The author may be among the last to interview the former Justice (now in assisted living), and had numerous interviews with her former law clerks, colleagues (including other Justices), and family friends. He had rare access to her private papers and seems to have done formidible reasearch at the Library of Congress and at the Court.He follows her life from her early days on a ranch on the Arizona-New Mexico border to her school days. She goes on to six years in combined undergraduate and law studies at Stanford, where she was classmates with, and briefly dated, the future Chief Justice William Rehnquist. We learn of her graduation with honors and, as a woman, being offered nothing at law firms but secretarial work. Even a dozen years after graduation, after she had married John O'Connor and moved to Phoenix, she was unable to join a law firm. Her husband was a partner in a top law firm while she had to hang out her shingle in a Phoenix strip mall. Nonetheless, she and her husband would raise a family and rise in Phoenix society and Republican politics, and she would get an appointment to the state senate -- a rough legislature and rude male colleagues, we're told -- and eventually to a position as a state court judge.We find how the times had changed so that, when Ronald Reagan became president, he would want a female Supreme Court appointment, and how O'Connor, then a state appellate judge, would be chosen. Most of the book, therefore, is of her time on the Court from 1981-2006. The book tells us much about the Court's work in those years, its internal dynamics and O'Connor's role, more and more, as a swing vote. As a legal history of the Court in those times, the book is valuable. It was a period of major, sometimes harshly controversial, rulings on everything from abortion to affirmative action to the Bush v. Gore election of 2000. As someone who has studied, and followed, constitutional law, I can say that it's a well-told and detailed look at the Court in those times, and of the bigger-than-life personalities that served alongside her: Brennan, Rehnquist, Scalia, Thurgood Marshall, and the rest.We get a sensitive discussion of her tragedies as well: her husband's creeping dementia, the creeping infirmities of her own aging, the decision of when, and how well-timed, was to be her retirement. That she was balancing all this, during her final years, with contentious and momentous caseloads says much. Highly recommend, not just to legal scholars but to anyone interested in this country's social history in the last quarter of the 20th Century. Highest recommendation. For a big dose of inspiration, I highly recommend reading this book, though I must admit I felt like an underachiever! I suspected Sandra Day O’Connor had impeccable credentials and connections in order to be appointed the first woman on the Supreme Court, but never would have imagined the hurdles she climbed to get there. She beat great odds as only 300 of more than 8,700 judges in the United States were women (and only 8 of 520 federal judges). The first chapters introduce Sandra growing up on For a big dose of inspiration, I highly recommend reading this book, though I must admit I felt like an underachiever! I suspected Sandra Day O’Connor had impeccable credentials and connections in order to be appointed the first woman on the Supreme Court, but never would have imagined the hurdles she climbed to get there. She beat great odds as only 300 of more than 8,700 judges in the United States were women (and only 8 of 520 federal judges). The first chapters introduce Sandra growing up on her family’s huge Lazy B ranch, working as hard as any of its male ranch hands. Her father was a tough nut but also Sandra’s biggest supporter. How she was raised seems to have played a significant role in building her strong and disciplined character.Fresh out of Stanford, Sandra was unable to find work in a law practice despite her already significant achievements, the partners’ beliefs that only men could be capable lawyers. She was offered a job as a secretary instead! She eventually found work as a deputy district attorney and worked her way up the corporate ladder. Her resume is impressive, the unwavering support and love of her family incredible. Sandra was a true pioneer, forging uncharted territory through smarts, hard work and lots of relationship building. Her ideas could be called radical for the times yet spot on perfect, eventually earning well-deserved respect at the highest levels of government. She made significant contributions pre-and post- Supreme court, and her Supreme Court record was impeccable. Sandra seemed to not only care about the rule of the law, but she cared about people and was meticulous in her research to arrive at opinions. Her story is so compelling. Sadly, she was diagnosed with dementia in 2018.Thanks to Random House for an ARC in exchange for an honest review. This book is well researched and written. The author's writing style makes this an interesting read. It covers the life of the first woman to be appointed to the Supreme Court. The book does an excellent job of describing how O'Connor arrived at the opinions that she wrote and how she dealt with differing opinions within the court itself including some attacks that were more personal versus objective. Justice O'Connor was a trail blazer in many ways and it is unfortunate that the current make-up This book is well researched and written. The author's writing style makes this an interesting read. It covers the life of the first woman to be appointed to the Supreme Court. The book does an excellent job of describing how O'Connor arrived at the opinions that she wrote and how she dealt with differing opinions within the court itself including some attacks that were more personal versus objective. Justice O'Connor was a trail blazer in many ways and it is unfortunate that the current make-up of the court has become increasingly political and positioned to undo much of the work that she did.I recommend this book to anyone who has an interest in the first woman to be appointed to the Supreme Court or the more recent history of the court.I received a free Kindle copy of First: Sandra Day O'Connor by Evan Thomas courtesy of Net Galley and Random House, the publisher. It was with the understanding that I would post a review on Net Galley, Goodreads, Amazon and my fiction book review blog. I also posted it to my Facebook and Twitter pages.I requested this book as I am interested in the Supreme Court and its history. I have read a number of books by the author. I read this two weeks after reading Jane Sherron De Hart's Ruth Bader Ginsburg: A Life. While I enjoyed learning more about O'Connor's life, I could not help to compare the two works and this one felt lacking. It seem to focus more on O'Connor's private life than how she moved up the legal ladder to her position as Arizona's assistant Attorney General. I wanted to learn more about landmark cases she argued. O'Connor is a figure I knew little about, except for her pioneering role as first female I read this two weeks after reading Jane Sherron De Hart's Ruth Bader Ginsburg: A Life. While I enjoyed learning more about O'Connor's life, I could not help to compare the two works and this one felt lacking. It seem to focus more on O'Connor's private life than how she moved up the legal ladder to her position as Arizona's assistant Attorney General. I wanted to learn more about landmark cases she argued. O'Connor is a figure I knew little about, except for her pioneering role as first female Supreme Court Judge. I hoped this book would make me appreciate her the way I appreciate RBG, but alas, it was not meant to be. 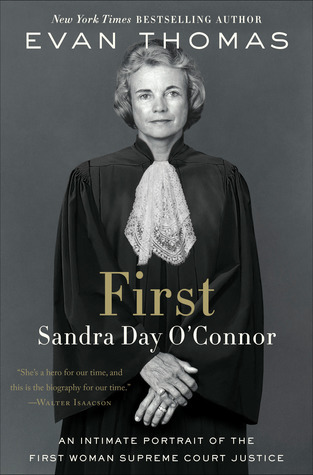 First is a beautiful biography of America's first woman Supreme Court Justice, Sandra Day O'Connor. It tells about how she grew up and became the first woman justice. I loved this biography and highly recommend it to fans of history, biographies, and influential women. I would like to thank Netgalley and the publisher for providing me with a copy of this book free of charge. This is my honest and unbiased opinion of it. Can't say enough about this in depth portrait of our first female Supreme Court Justice! As a female attorney myself, I was initially drawn to the title because of the many great acts Justice O'Connor was involved with while on the bench. But I gleamed so much more from this book. From her up bringing in Arizona, her time in law school as a female in a predominately man's world, to her care of her husband during their later years, I finished this book (in one sitting I might add) feeling inspire Can't say enough about this in depth portrait of our first female Supreme Court Justice! As a female attorney myself, I was initially drawn to the title because of the many great acts Justice O'Connor was involved with while on the bench. But I gleamed so much more from this book. From her up bringing in Arizona, her time in law school as a female in a predominately man's world, to her care of her husband during their later years, I finished this book (in one sitting I might add) feeling inspired to accomplish more not only in my career but as a person as well. The author's vivid description of paints such a clear picture of one of America's most inspiring women. Clear your schedule because you won't be able to put this biography down! Although Evan Thomas is not a scholarly biographer on par with Ron Chernow, he used all of the new information and documents about O'Connor to write an interesting and illuminating look into her fascinating and ground-breaking life. Thomas had the journal/diary of O'Connor's husband John, and the result of this is a uniquely rich behind-the-scenes portrayal of their touching and loving relationship, her career, and what it was like to be the husband of the most public and powerful woman in Ameri Although Evan Thomas is not a scholarly biographer on par with Ron Chernow, he used all of the new information and documents about O'Connor to write an interesting and illuminating look into her fascinating and ground-breaking life. Thomas had the journal/diary of O'Connor's husband John, and the result of this is a uniquely rich behind-the-scenes portrayal of their touching and loving relationship, her career, and what it was like to be the husband of the most public and powerful woman in America for decades. His eventual decline from Alzheimer's and how it affects O'Connor personally and professionally was touching. Few knew at the time what she and John were experiencing behind the scenes, and she always carried herself with no sign of the fear and sorrow she was feeling. This dimension was missing or covered only shallowly in previous biographies of O'Connor, making this the most complete one, if you're trying to decide which of the biographies to read.O'Connor was prepared, from her southwestern ranch upbringing to her unprecedented successes in Arizona politics, to break the Supreme Court's glass ceiling. As this book demonstrates repeatedly, she had a gift for helping bring conflicts to resolution, or at least to compromise agreement, making her the perfect justice to bridge the ideological chasm between the Supreme Court's conservatives and liberals. This book does an excellent job of tying the way she conducted herself on the bench to life lessons she learned earlier in life from her father, her mother, life on a ranch, and at various stages of her legal career. She faced harassment, opposition, prejudice against her as an intellectual woman in a historically male-dominated profession, yet she stood up for herself strongly without becoming angry or bitter or letting this conduct toward her define who she was or what she could become. She was always keenly aware that she was blazing a trail for women to follow behind her, and she was determined not to burn bridges by proving prejudiced men right in their belief that women were not emotionally balanced and strong enough to succeed in law. She set a brilliant example for other women to follow, and she was determined to diversify the legal profession by choosing not just women, but racial minorities, and even physically handicapped law clerks that her male colleagues typically ignored. She was an inspiration to all people underrepresented in male-dominated professions, and the book contains many observations from women who became what they later became because of O'Connor. This biography provides historical context for many of O'Connor's most influential and precedent-setting votes and how she came to her decision for each. Some of her votes surprised and angered those who assumed she would always vote on the conservative side, but the book explains why she voted the way she did on cases involving abortion, affirmative action, Bush v. Gore after the 2000 election, holding terrorists as enemy combatants, and many more. The book also offers very interesting behind-the-scenes looks at how the justices interact in and out of court, the way the socialize, and O'Connor's key role in uniting them together in relationships that enhanced their functioning together as a deliberative body because they understood each other's motivations and personalities better. By making the justices do something as simple as eating lunch together and talking about anything but work, she came to know how to find middle ground with each as they went back into session and debated monumental issues with ramifications for all Americans.I rated this book 5 stars because it is the best and most complete biography available of this critically-important trailblazer in American history. I would rate Thomas's writing as 4.5 stars because he lets his personal dislike for every conservative politician or Supreme Court justice mentioned in the book seep into his explanations of historical events that led to Supreme Court cases O'Connor played a key role in deciding. Thomas cannot say a kind word about any conservative, and he dismisses the legal opinions and reasoning of the conservative justices with short-shrift explanations that make it sound as if O'Connor in dissent of her conservative colleagues, and the liberals on the court, were the only justices who really gave serious scholarly thought to their opinions. Every author has personal political bias, but Thomas could have done a better job of being more impartial when describing the positions on each side, conservative and liberal, of controversial social issues that made it to the Supreme Court. Thomas should understand that readers want to know O'Connor's opinions and her colleagues' opinions, not the author's biases. However, the book is well-written and engaging enough when Thomas focuses on O'Connor and what SHE thought about these issues and why, to not detract too much from the reading experience. I would still recommend this as the best biography of O'Connor available today, and I'm glad I read it. My appreciation for her, which was already great, grew from reading this account of her life and her positive impact on America. Through NetGalley, I received a complimentary copy of this book from the publisher, Random House. Opinions expressed in this review are completely my own. The book shares insight into O’Connor’s childhood, education, family, and career. It also addressed the challenges Sandra faced after graduating from law school. Sandra had to leave Lazy B when she was six to live with her maternal grandparents and go to school. The Lazy B roots will influence much of O’Connor’s life. Her children and family w Through NetGalley, I received a complimentary copy of this book from the publisher, Random House. Opinions expressed in this review are completely my own. The book shares insight into O’Connor’s childhood, education, family, and career. It also addressed the challenges Sandra faced after graduating from law school. Sandra had to leave Lazy B when she was six to live with her maternal grandparents and go to school. The Lazy B roots will influence much of O’Connor’s life. Her children and family were always top priority to Sandra. The O’Connors had three sons and Sandra was able to successfully blend motherhood and a career. She was a strong-willed, intelligent, and humble woman.“John O’Connor was not threatened by her “intellectual power” and very supportive of Sandra. John and Sandra had a good time together dancing, joking. “O’Connor loved amateur theatricals, both watching them and putting on her own skits with John.” In this book, I felt a clear understanding of John and Sandra’s relationship. The book touches on the impact to John when Sandra was appointed to the Supreme Court. He gave up his influential position in Phoenix and found a position in Washington. “The O’Connors’ closest friends saw the effort that John put into his role as husband of the Most Powerful Woman in America.” She was the “first” at many things including “…the first female majority leader of a state senate in Arizona and U.S. Supreme Court.” Sandra mentored her clerks and was involved in their personal lives. She would walk away from fights she deemed unnecessary, while never shying away from the important ones. She knew when to tease, when to flatter, and when to punch…” “O’Connor was the most powerful Supreme Court justice of her time.” For most of her 24+ years on the Court, she was the controlling vote on many of the great societal issues. Sandra had a close relationship with her law clerks. The clerks understood that they were undergoing more than legal training in her chambers.” The book frequently touched on an exercise class Sandra started for the interns (and anyone else who wanted) and herself to participate before the workday.Once confirmed, “The justices, she was surprised to discover, rarely spoke to one another; they preferred to communicate by memo.” “,,,justices rarely spoke to each other outside of conference. Their chambers were “nine separate one-man law firms,” as one justice put it. With few exceptions, they did not visit each other or pick up the phone. Sandra was instrumental in changing this. Justice O’Connor “was more in sync with the public mood than her fellow justices.” A great deal of the book addresses major cases before the Supreme Court and Sandra’s stand on the cases, including abortion, elections (Bush v. Gore), women’s rights. Often she was the “fifth vote.” Her childhood and background greatly influenced her decisions Book rolled right along but bogged down in the details of legal cases which may lose some readers. Ruth Bader Ginsburg joining the court is touched upon. “The two women were not natural pals… but … When Ginsburg was diagnosed with cancer in 1999, O’Connor was able to guide her through…” O’Connor’s influence on Ginsburg is discussed. The relationships and approaches with the other justices was shared. Sandra. “made it her business to get along with every justice…” “The reason this place was civil was Sandra Day O’Connor.” “The plight of women and children reached a deep place in O’Connor. So, too, the plight of minorities. But she continued to see no easy answer for the legacy of racism in society. Race, or rather racial preference, continued…” Health issues were raised up: Sandra battled breast cancer. She fought this battle while on the Court and “returned to the Supreme Court … ten days after surgery.” During this time, the book shared her emotional turmoil but “hardly a pause in the O’Connors’ social calendar.” Sandra “…did not speak publicly about her cancer for six years.” John was later diagnosed with Alzheimer’s and in true Sandra form she took care of her husband much longer than most. She was very reluctant to have him in a facility. She stepped down from the Supreme Court because “John needs me.” True to form, she chose her family over her career. She was actually modeling a balanced life… Make time for your family. Take care of yourself.” “Never complain, never explain,“ might be her motto. The book ends indicating Sandra is now battling Alzheimer’s disease. I found this to be a well written book and very insightful of Sandra Day O’Connor. A lady I can admire. Evan Thomas has written a biography of Sandra Day O’Connor that is well worth reading for many reasons. The title hints at the importance of her role as the first female Supreme Court Justice, but following her life story in many ways is to follow the part of United States history that occurs in her lifetime.Born in El Paso in 1930, her life on a cattle ranch came at a time when girls were expected to grow up and settle into good marriages as gracious hostesses for ambitious husbands. She sets h Evan Thomas has written a biography of Sandra Day O’Connor that is well worth reading for many reasons. The title hints at the importance of her role as the first female Supreme Court Justice, but following her life story in many ways is to follow the part of United States history that occurs in her lifetime.Born in El Paso in 1930, her life on a cattle ranch came at a time when girls were expected to grow up and settle into good marriages as gracious hostesses for ambitious husbands. She sets her sights on Stanford instead and graduates with high class rankings in her law school class only to face the fact that no law firm would interview her for a position since she was a woman. The biography is an account of her finding a way to skirt the heavy glass ceiling to become the first female majority leader of a state senate, a judge on the Arizona Court of Appeals, and finally the first female Supreme Court Justice. An amusing aside in the course of Reagan’s nomination to that court comes from Jim Baker’s account that concludes, “Nancy Reagan was on board. If she hadn’t been, we would not have done it.”She appears to be the woman who can “have it all” as she entertains graciously first in their Arizona style home and then in Washington. Thomas describes her as having a mixture of elegance, wisdom, and toughness whether she is tending home fires or making difficult judicial decisions. For example, he quotes a New York Times article that pokes fun at government acronyms such as POTUS for the president and SCOTUS for the “nine men” who interpret the law. Sandra in her lighthearted letter to the editor says that for two years the court has not consisted of nine men and signs it FWOTSC for “first woman on the Supreme Court.” Her decisions strike a note of independent thought as she weighs them carefully rather than following a prescribed party line agenda. Her husband John should get his due for his encouragement and support through her entire career. Their son Jay said of his father, “He walked away from a firm he loved, a city he loved, a practice he loved, and never gave it a second thought.” In their interviews with the author, their sons also supported the account that Sandra managed to give full support to her family as well as her career. Evan Thomas gains authenticity with his research into first-hand accounts, journals of the participants, and interviews. This is a very good read, giving an authentic look at the life of the first female Supreme Court Justice as well as an interesting picture of the history that surrounded it and the workings of the court itself. First is Evan Thomas wonderfully written biography of the first woman appointed to the Supreme Court Sandra Day O’Conner (SOC) and follows her rise from navigating the world of Stanford Law to finding a job in a world largely closed off to women to thriving in the Supreme Court as one of the key swing votes shaping policy. Often referred to as the mother of the court her congeinatly would bring many of the judges together and forge compromises on issues that would have otherwise been bogged down First is Evan Thomas wonderfully written biography of the first woman appointed to the Supreme Court Sandra Day O’Conner (SOC) and follows her rise from navigating the world of Stanford Law to finding a job in a world largely closed off to women to thriving in the Supreme Court as one of the key swing votes shaping policy. Often referred to as the mother of the court her congeinatly would bring many of the judges together and forge compromises on issues that would have otherwise been bogged down from abortion to affirmative action to civil rights. Originally appointed as one of the conservatives of the Court she found herself a moderate as the court shifted further and further right despite her own opinions not necessarily evolving. The partisan nature of the hearings for Supreme Court justices today (where one side wants to hear you say you will overturn Roe and the other side wants to hear you say you will defend it with your life) were not the norm for her time and the topic did not even really come up during her confirmation. Her lifelong friendship with fellow Justice William Rehnquist and her support from both Barry Goldwater and her husband were great tidbits and followed up in detail in this book. Evan Thomas succeeds as he always does in bringing you into the life of the person he is writing about and making you feel as though you are living and seeing them. A great read and a lot of fun for those interested in the Supreme Court. I was very excited to receive a free copy from netgalley for an honest review. Short answer- I loved this book!Long answer- I grew up wanting to be this woman, and after studying law, and reading countless briefs written by her as well as seeing documentaries throughout my life, I felt like I knew a fair amount about who she was. But, this book showed what shaped her and how irreverent she is, but also showed how seriously she took her calling. There’s a difference in knowing what to do, and kno I was very excited to receive a free copy from netgalley for an honest review. Short answer- I loved this book!Long answer- I grew up wanting to be this woman, and after studying law, and reading countless briefs written by her as well as seeing documentaries throughout my life, I felt like I knew a fair amount about who she was. But, this book showed what shaped her and how irreverent she is, but also showed how seriously she took her calling. There’s a difference in knowing what to do, and knowing how do do it effortlessly. I think anyone wanting to view challenges in their career, or how to give back after tacking those challenges should read this. She has heart, she has style, and she knew how to go on. I couldn’t read this book fast enough, or slow enough. I wanted it to continue so I could learn even more about the fascinating life of the first woman Supreme Court Judge. This book is so well researched! The details obtained information through diaries, articles, interviews with family and friends and each lending to a more concrete and established labor of live. I even loved reading the annotated bibliography!I laughed, I cried, and I begged to be one of the clerks in SOC’s staff. This book i I couldn’t read this book fast enough, or slow enough. I wanted it to continue so I could learn even more about the fascinating life of the first woman Supreme Court Judge. This book is so well researched! The details obtained information through diaries, articles, interviews with family and friends and each lending to a more concrete and established labor of live. I even loved reading the annotated bibliography!I laughed, I cried, and I begged to be one of the clerks in SOC’s staff. This book introduced me to one of the most resilient women in America. While I will never carry the weight of her personal history and accomplishments, I am proud to be a woman who knows that doors have been opened for me because of her dedication, fearlessness, ability to be objective and to stand her ground in a man’s world. The image of her breaking through the glass ceiling and mystifying her male colleagues by her knowledge, determination, and her boldness to stand with them is a large part of the woman's movement and advancement. An absolute triumph. The public knows so little about any given justice, even a famous, historic justice like O'Connor. Thomas skillfully brings her to life. Thomas is to be commended for his perfect pacing. He seems to know exactly what to include to fascinate, entertain, and illustrate. Every aspect of her life receives exactly the right amount of attention. Answers the big questions (e.g., why was she chosen?) as well as the smaller ones (how did she end up at Stanford from Lazy B?). A must r An absolute triumph. The public knows so little about any given justice, even a famous, historic justice like O'Connor. Thomas skillfully brings her to life. Thomas is to be commended for his perfect pacing. He seems to know exactly what to include to fascinate, entertain, and illustrate. Every aspect of her life receives exactly the right amount of attention. Answers the big questions (e.g., why was she chosen?) as well as the smaller ones (how did she end up at Stanford from Lazy B?). A must read for anyone interested in Sandra Day O'Connor, the Supreme Court, or lovers of fantastic biography. This is a well researched book about an incredible woman. It includes an insert of 16 pages of color photos and an extensive bibliography. That said, I found it a bit dry. I can't say why I kept nodding off while trying to read it, but it just wasn't as interesting to read as it should have been. Worth reading because it adds details of her later life that you won't find in earlier biographies, I suppose. For that reason, I will be passing it along to an elderly neighbor.I won a copy from a Good This is a well researched book about an incredible woman. It includes an insert of 16 pages of color photos and an extensive bibliography. That said, I found it a bit dry. I can't say why I kept nodding off while trying to read it, but it just wasn't as interesting to read as it should have been. Worth reading because it adds details of her later life that you won't find in earlier biographies, I suppose. For that reason, I will be passing it along to an elderly neighbor.I won a copy from a Goodreads giveaway in exchange for a review. Fascinating portrait of one of the most influential woman in US history. I especially enjoyed the views of SOC (as she's referred to by her husband) that were provided by the dozens of law clerks who worked with her over the years. Her swing vote on many landmark issues will long outlive her. Her relationship with Rehnquist was something I had not heard about, but one that surely had a bearing on who she was, and how she got there. Really well done. Many of her most well known decisions were written while I was in law school or soon before/after so I’ve read them over and over. The author does a really good job of providing context for those decisions. I will forever be grateful to Justice O’Connor for her work with iCivics and for being a model of civil civic engagement. She, along with Justice Ruth Bader Ginsburg have made tremendous impact on me and have been an inspiration. Sandra Day O’Connor was never my hero, but I respect and admire the way she was the first female justice on the Supreme Court. I liked the way her relationship with her husband was described. Her friends, her choices, her sense of humor and her love of the Southwest held my attention. Many interesting facts about “The Brethren” enhanced the telling of her story. A very long book. WOW, I learned so much reading this book! This tells the story of the first woman on the Supreme Court. I loved learning how she didn't accept excuses, believed that you needed to be fair and how she sometimes struggled with her beliefs of, family, civic duty, the Constitution and her personal feelings. Having admired Justice O'Connor for her legal mind and pioneering spirit, I greatly appreciated received the ARC of her biography. The only reason this was not a 5 star book for me was part of the judicial proceedings in the middle of the book. This part needed to be written to make the book complete, but wasn't as enjoyable for me as the rest. I hope this is well received by the public.